Ports '92 Conference To Be Held July 20-22 In Seattle, Wash. 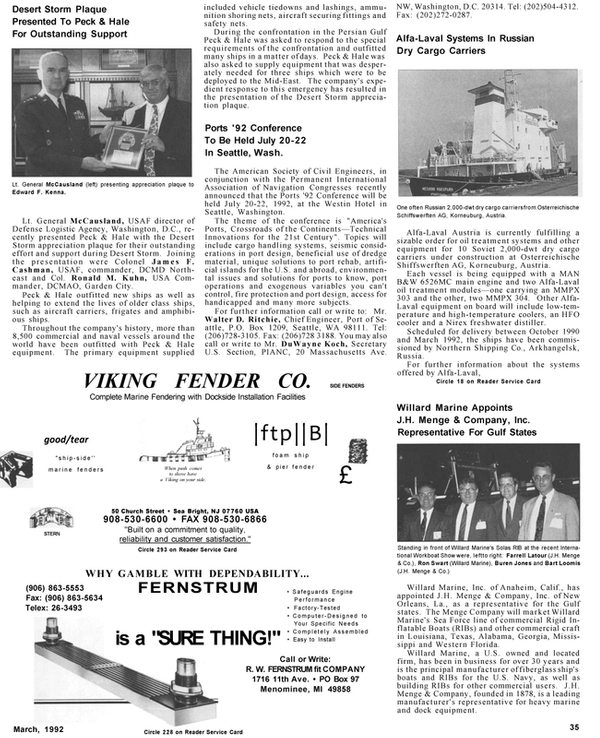 The American Society of Civil Engineers, in conjunction with the Permanent International Association of Navigation Congresses recently announced that the Ports '92 Conference will be held July 20-22, 1992, at the Westin Hotel in Seattle, Washington. The theme of the conference is "America's Ports, Crossroads of the Continents—Technical Innovations for the 21st Century". Topics will include cargo handling systems, seismic considerations in port design, beneficial use of dredge material, unique solutions to port rehab, artificial islands for the U.S. and abroad, environmental issues and solutions for ports to know, port operations and exogenous variables you can't control, fire protection and port design, access for handicapped and many more subjects. For further information call or write to: Mr.
Walter D. Ritchie, Chief Engineer, Port of Seattle, P.O. Box 1209, Seattle, WA 98111. Tel: (206)728-3105. Fax: (206)728 3188. You may also call or write to Mr. DuWayne Koch, Secretary U.S. Section, PIANC, 20 Massachusetts Ave.
NW, Washington, D.C. 20314. Tel: (202)504-4312.